Learning to take a deep breath is a skill I work on with many children in occupational therapy. It slows down the body and helps to refocus a brain that is being flooded with emotions. This skill is best practiced during play time, so here are 5 ways to work on teaching children about taking a deep breath. Find an object that moves when you blow. 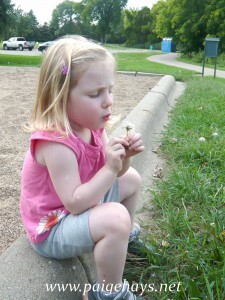 Go on a nature walk and find things to blow- dandelions, leaves, grasses, and flowers. Or try a feather (from any craft store) or pinwheeel (easy to make or the dollar store usually has them). A lightweight scarf or tissues will also work to explore how breathing can move objects. Blow bubbles through a straw in a cup water or even the bathtub. See this post on bubble blowing in soapy water. Or just blow traditional bubbles together. Try using your fingers as birthday candles and blowing them out one by one. Put both hands in prayer position on your chest, then blow out as you reach your arms straight up and out as a volcano exploding. Put both hands near your mouth like they are holding a tennis ball, then as you blow expand you hands like a huge balloon. Pair breathing with a movement to build awareness of breathing. Breath as a swing moves in and out, as you roll a ball back and forth, or as you practice yoga or karate moves. Use music to help you. Sing, hum, or play a wind instrument (whistles). Show the child how you have to take a bigger breath to make more music and how to control your breath to control the music.